Regularly we add new classes (Roller, Rock & Release, Pilates Polestar Pro, Pilates Power, Pilates Posture) and extra classes (mOOVe, Barre Concept, Jumping Fitness) to our schedule. To support you in making a good choice for the right class, we visualized in our schedule the level of the class and which goal you can attain with this class. Green Classes are Beginners, or Level 1 classes. Orange classes are Advanced, or Level 2 classes. Purple are Advanced to Professional level, also known as Level 2/3. Red are classes of All Levels (level is adjusted to the present students). Furthermore we have set some indicators, to help you target your training. Have a look here at your Season Schedule. 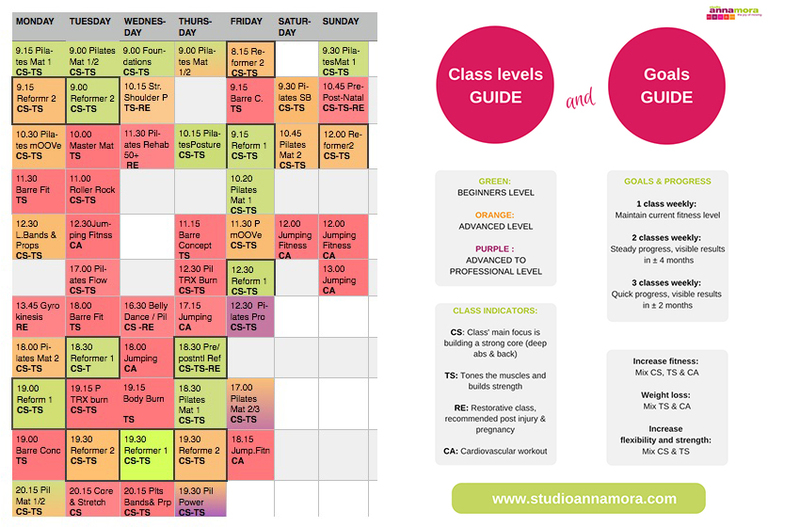 Please book your classes ahead, as this makes sure you have a place!